The Heritage Resort invites you on a charming and unforgettable holiday trip to one of the best tourist destination of Uttarakhand known as Kausani. The Heritage is one of the best Hotels in Kausani, is a deluxe hotel in Kausani which offers comfortable stay at affordable cost..
Offering spectacular view of the Himalayan ranges, Tea Gardens and long deep valley view of Baijnath/Garur, The Heritage Resort is situated at the heart of Kausani, where you are face to face with supreme natural beauty and refreshing weather. The Heritage Resort is located near Tea Garden, on the Baijnath Road. Distance to Heritage Resort in Kausani from Delhi is 419 kms, Ranikhet (via Binta) is 50 km, Ranikhet (via Kosi) is 75 km, Almora is 52 km, Nainital is 115 km, Jim Corbett Park is 184 km. There are 10 luxuriously made Cottages in Hotel Heritage Resort with all the basic amenities to make your stay comfortable in Kausani. 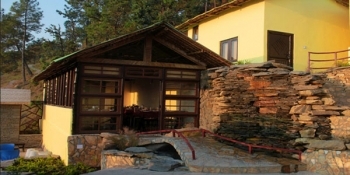 There is a multi cuisine restaurant and open air coffee shop in The Heritage Resort in Kausani. 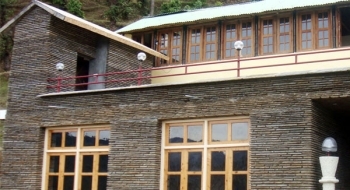 - Accommodation well facing Himalayas. - Daily Morning And Evening tea, coffee. - Daily Breakfast & Dinner on menu plan, or Buffet. - Bonfire with light music every evening. - Free use of in house Games. - Morning & Evening Tea/Coffee, Breakfast and Dinner. - Well appointed rooms facing Himalayas. By Air: The nearest air link from Kausani is provided by Pantnagar Airport, which is about 177 km away from hill resort. After getting down from the plane, you can either hire a private taxi or board an Uttarakhand state transport bus to Kausani. By Train: Kathgodam is the nearest railway station from Kausani, which is about 142 km away. One can hire a taxi or opt for bus to reach Kausani. By Bus: Kausani is well connected by state owned bus services. Bus services connect Kausani to other hill stations like Almora, Ranikhet, Nainital and Pithoragarh. Many overnight buses owned by private companies ply between New Delhi and Kausani.